What was the inspiration for your submitted pattern? — I suppose I was tired of mittens that never quite fit right. Was the design process smooth or did you run into any struggles? — The process was fairly smooth, I had a bit of a hiccup when designing the thumb. What was the most valuable lesson you learned along the way? — Stop being afraid of the process of design. Just try it. What materials are required to complete this pattern? — Size 3.25 mm double-pointed needles and 75 grams of worsted weight yarn. Noro Silk Garden or any worsted weight. Not much of an issue, really, as you will make decisions on the comfort level as you go. 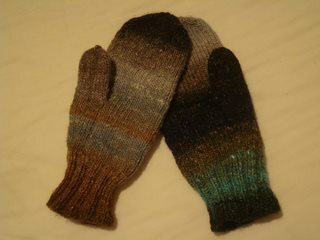 These mittens will feel ‘firm’, rather like a sock, due to the size of the wool and the size of the needles. Calling all creative knitters: Submit a design to Interweave Knits!